When you download a software from Novo Tech Software website, it runs as Evaluation Version for 14 days. During this period, certain features of the software may not be available while you are still able to generally evaluate the software capabilities. 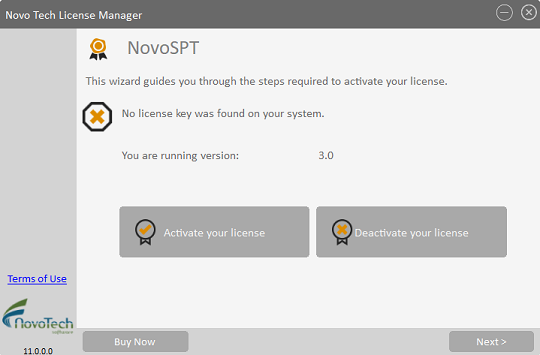 When the evaluation period is over, the application will only run with a valid license purchased from Novo Tech Software Ltd. Please note that any manipulation of the software files and/or computer date voids the End User License Agreement and may cause the software to stop working permanently. You can buy a Perpetual or Lease license from our Online Store. In order to be able to run the software you need an 'Activation Key'. This will activate the software on your computer. Here is how to obtain an 'Activation Key'. Immediately after downloading the Evaluation Version of the software from our website, a trial 'Activation Key' will be emailed to you. Once you complete the purchase of a Registered Version, an 'Activation Key' will be emailed to you which will activate your computer for a certain time (i.e. Lease) or without time limit (i.e. Perpetual). 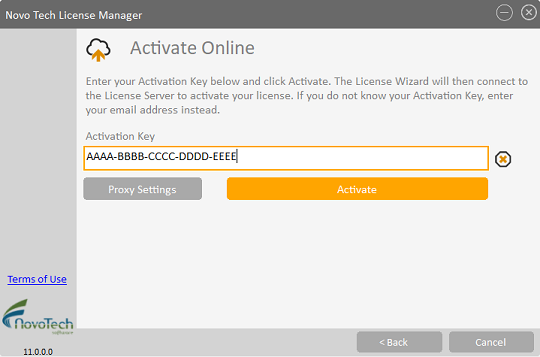 In either case, once you receive the 'Activation Key', copy it from your email and enter the key in the License Manager page. This page will show up when you first run the program. It may take a few minutes to register the 'Activation Key' on the licensing server. Note: if you have purchased a 'floating' or 'network' license, use your 'Activation Key' on all computers that need to be activated. 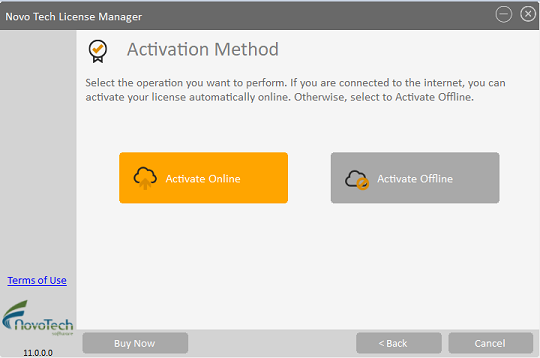 For example if you purchased a 5 seat network license, use the 'Activation Key' you received by email on all 5 computers to activate them. © 2019 Novo Tech Software. All Rights Reserved.